On May 25, Solo: A Star Wars Story won’t just be revealing the origins of characters like Han Solo, Chewbacca, and Lando Calrissian, we’ll also get to see how the Millennium Falcon came to be the fastest hunk of junk in the galaxy. Well before Han Solo dumped Jabba the Hutt’s smuggled cargo, the Falcon looked considerably less like garbage. 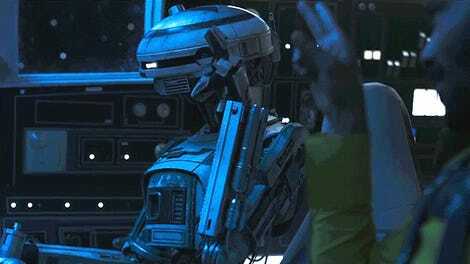 With the first Solo trailer and new stories coming out about the film, we’ve realized the Falcon looked a bit different before Han got his hands on it. And we’re not just talking about the exterior either. This week’s episode of The Star Wars Show visited Madlyn Burkert, who quite possibly has one of the coolest jobs in our galaxy. At graduate school she studied library science, which first led her to a job as an archivist at the Jim Henson Company, but eventually she assumed the role of Lucasfilm’s official collections and exhibitions archivist, which basically means she gets to take care of all the props and costumes that have appeared in all the Star Wars movies. 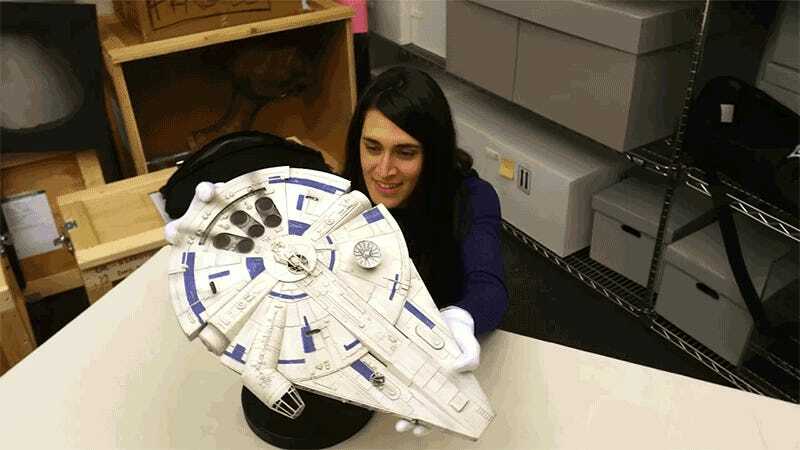 That also includes all of the props that were used to film Solo, and lucky for us, as Burkert gave The Star Wars Show a tour of the Lucasfilm archives, she also happened to pull out a model of the Millennium Falcon from the spinoff film. The shots are fleeting, but it’s our best look yet at the original look of the Falcon, which includes a different paint scheme, less wear and tear, and an extra shroud covering the ship’s forward mandibles. I’m going to go out on a Wookiee limb here and guess that at some point during Solo we’re going to see the Falcon have a nasty run-in that results in that forward shrouding being torn off, revealing the shape of the Corellian light freighter we all know so well. As for the upgraded paint job? 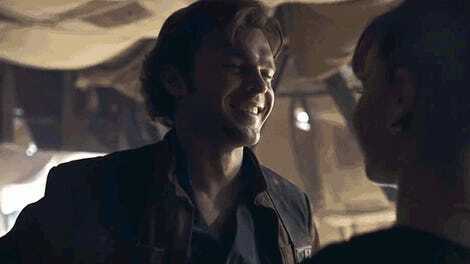 I assume that’s just part of life as a smuggler.